Unique, stylish wall mounted bathroom double corner shower soap shelf. Double shower shelf is made out of brass in a polished chrome finish and plexiglass. Plexiglass is available in transparent or white. 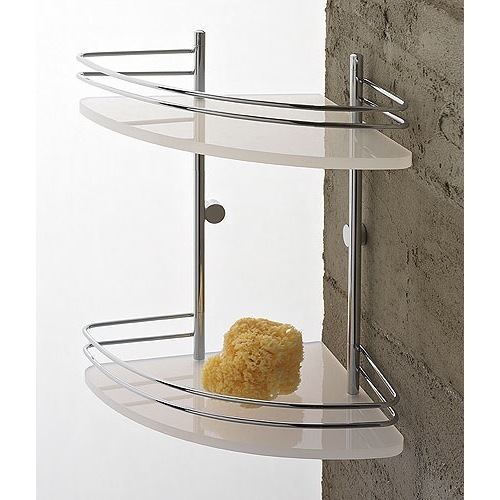 Stylish shower shampoo or soap shelf for the bathroom. Made in Italy by Toscanaluce. Distance from corner to outer corner (the 'side') = 8.1"
Distance between shelves = 8.4"
Widest part from from left to right (front side) = 11.2"